Pancake Day 2019 is here! 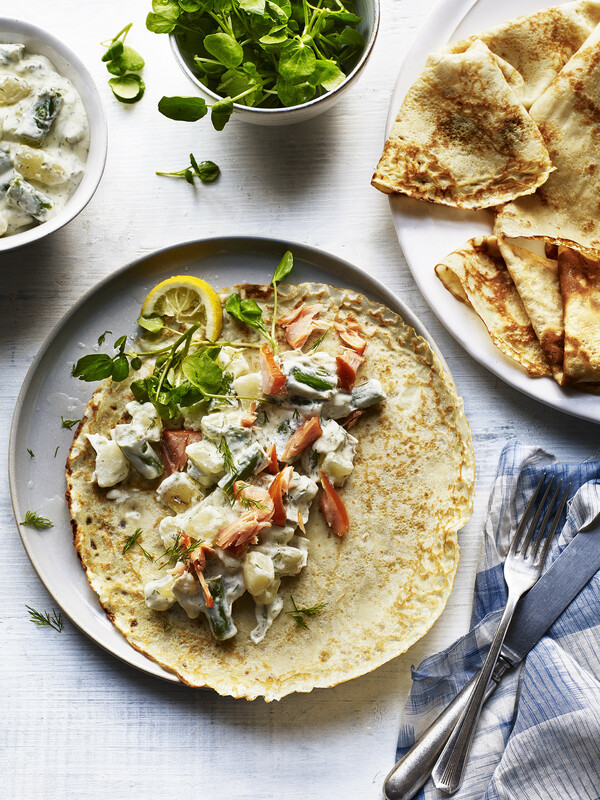 For those looking for a different approach this year, why not try out this delicious savoury pancake recipe with a twist! Instead of regular pancake batter, this recipe makes use of the potato. This approach makes use of salmon and asparagus which blends deliciously with the pancake base below. Quick, tasty and just as easy to cook up as regular pancakes. Start by making the pancakes, or you could make these the day before and keep wrapped in the fridge. Sift the flour and salt into a bowl. In a jug melt the butter then whisk with the milk and egg, pour into the flour and mix well until smooth. Place a large non-stick frying pan over a medium-hot heat. Add a little sunflower oil and then a ladle full of the batter, making sure to swirl the batter around the pan. Cook for about 1 minute, flip and cook on the other side for 20-30 seconds. Repeat until you have 4 large pancakes. For the filling, Cook the potatoes in salted boiling water until tender and drain. Chop the asparagus into bite sized pieces and cook for 2 minutes in boiling water, drain. In a bowl mix the crème fraiche, dill and lemon juice. Stir in the potatoes and asparagus. Place a pancake on your plate, spoon the potato filling onto the pancake, top with the flaked smoked salmon and serve with watercress. Allow the roasted potato to lend itself to Asian cuisine with this inspiring combination of spud and slaw. This is a real unique culinary delight to throw into your repertoire!